The Homido is a pretty nice looking VR headset with adjustable lenses. It comes with 3 lens holders for near sighted, far sighted and normal vision. It also has wheels on the sides and above to adjust distance between lenses and distance between your eyes and the lenses. The device should fit everybody. The foam around the head is not very thick, but it is comfortable. The headset has a 3 way adjustable headstrap, like Oculus Rift. FOV is 100 degrees when using a 5 inch phone. Update 27-08-2016: Homido launched it's second premium headset: Homido V2, with conductive button! 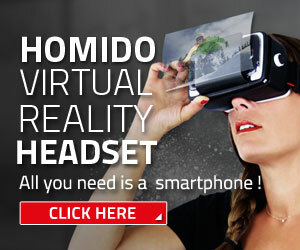 The Homido VR is available for the iPhone models 5, 5S, 5C, 6(S), 6(S) plus,7 and 7 plus. The website states that previous iPhone are compatible but with limitations. Probably due to display size. The Homido is a good quality headset. The lenses are big, the wheels feel strong and it's comfortable. So I am happy. It is a little expensive but if you really like virtual reality I recommend this headset because it gives a good immersion. It has a much better quality than (for example) the Durovis Dive. Also it's not to big or heavy with a decent weight of 250gr. Which one is better , BOBO VR Z4 or HOMIDO?